The IICSI seeks a part-time Community Engagement Officer, Partners & Research. 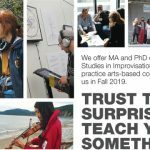 New MA and PhD programs in Critical Studies in Improvisation, are being offered by the IICSI through the University of Guelph campus! 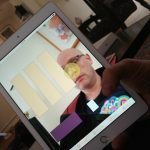 AUMI Sings, Research in Progress! November 10th was the first trial of AUMI Sings, an instrument to facilitate participation in choirs. Read about the pairing three differently-abled AUMI Sings singers w/ the St. John’s Vocal Exploration Choir by IICSI researchers. 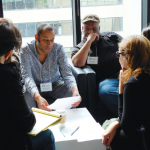 IICSI is launching new MA and PhD graduate programs in Critical Studies in Improvisation, at the University of Guelph! 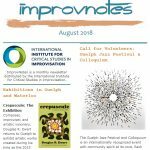 The IICSI is launching new MA and PhD graduate programs in Critical Studies in Improvisation, at the University of Guelph! 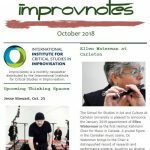 Short Takes, improv news from the October 2018 issue of Improv Notes. 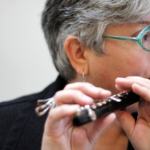 The School for Studies in Art and Culture at Carleton University is pleased to announce the January 2019 appointment of Ellen Waterman as the first Helmut Kallmann Chair for Music in Canada. Join us for the launch reception at 5pm on Wednesday, September 12th at Boarding House Arts, 6 Dublin Street, Guelph, ON. The exhibition will present the year-long project and provide maps to site-based installations happening throughout the weekend of the Guelph Jazz Festival, in various locations around the city of Guelph. From the August 2018 edition of our Improv Notes newsletter. 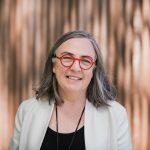 IICSI team member Gillian Siddall has become the new President and Vice Chancellor of Vancouver’s Emily Carr University of Art and Design (ECUAD). Dr. Siddall (PhD English, University of Western Ontario) is stepping down from her role as Dean of Social Sciences and Humanities at Lakehead University, Thunder Bay, in order to begin at ECUAD September 1. 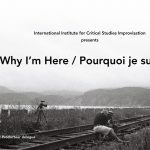 Pourquoi je suis ici / Why I’m Here to premiere at the Festival Les Percéides! 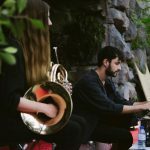 In this poetic exploration of sound, silence, movement, and place, director João França provides a glimpse into a magical world where musicians of diverse ages and abilities come together in an inclusive and supportive environment to explore the possibilities of improvisational collaborations (music, dance, and visual art).